Muslim leaders have condemned an attack on an Anglican clergyman calling the assault "cowardly and despicable". Canon Michael Ainsworth, 57, was beaten by youths described as Asian in the grounds of St George-in-the-East, Shadwell, east London, on 5 March. Mr Ainsworth suffered cuts, bruises and two black eyes when he asked three youths to lower their voices. Abdul Qayum, imam of the East London Mosque, also said: "Our congregation is united in condemnation." The imam described the attack as "cowardly and despicable". Police are treating the incident as a "hate crime" and are looking for the youths. Mr Ainsworth's attackers jeered at him about his occupation, during the attack. Dilowar Khan, head of the East London Mosque and London Muslim Centre, said: "The youths who attacked Canon Michael need to be brought to justice. "We have become increasingly concerned about antisocial behaviour among a minority of youth, particularly the rise of alcohol-related incidents. The clergyman's wife Jan, a priest, thanked church members for their support during a church service on Sunday. 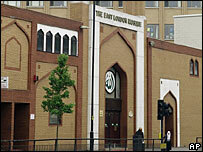 Tower Hamlets in east London, where the church is located, has a large Muslim community and Mr Khan said the incident should not affect "the hard work of communities in Tower Hamlets to create social harmony". Following the assault the Bishop of London, Bishop Richard Chartres, said on Sunday that clergymen who were part of the community were "vulnerable" to attacks.